Aigle is the capital of the district of Aigle in the canton of Vaud in Switzerland. The town has a population of 9,599 people. The name of this municipality in French means eagle. Aigle lies at an elevation of 415 m (1,362 ft) about 13 km (8.1 mi) south-southeast of Montreux. It is on the east edge of the Rhone valley, at the foot of the Swiss Alps. Aigle has an area, as of 2009, of 16.41 square kilometers (6.34 sq mi). Of this area, 5.59 km2 (2.16 sq mi) or 34.1% is used for agricultural purposes, while 6.13 km2 (2.37 sq mi) or 37.4% is forested. Of the rest of the land, 4.2 km2 (1.6 sq mi) or 25.6% is settled (buildings or roads), 0.45 km2 (0.17 sq mi) or 2.7% is either rivers or lakes and 0.1 km2 (25 acres) or 0.6% is unproductive land. Aigle includes the villages of Le Cloitre, Vers Pousaz, and Fontanney. The surrounding municipalities are Yvorne, Leysin, Ormont-Dessous, and Ollon in the canton of Vaud, and Vouvry and Collombey-Muraz in the canton of Valais. A mention in 1153 gives the name as Aleo. Holy Roman Emperor Henry IV gave the territory of Aigle in 1076 to the house of Savoy. The Abbeys of Great Saint Bernard and Saint-Maurice also had holdings in Aigle, and the latter established a priory, from which the village of Le Cloitre takes its name. In 1231, Aigle was made a market town by Thomas I of Savoy, and in 1314 it was raised to a free city by Amadeus V of Savoy. In 1475, the mountain regions of Saanen and Pays-dEnhaut, who were allied with Bern, attacked and burned the tower of Aigle Castle. They then gave Aigle town and the surrounding district, including Ollon, Bex, and Les Ormonts, to Bern in exchange for not having to pay one-third of their income to Bern. In the treaty of Fribourg from 1476, Fribourg received rights over the Aigle district, which they gave up to Bern in 1483. 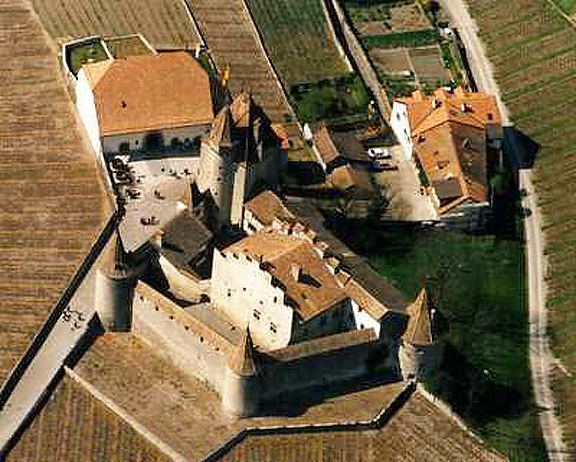 Bern rebuilt Aigle Castle in 1489 and made it the seat of the bailiwick of Aigle. The Aigle bailiwick included all of the present district except Villeneuve. It was thus the first of the French-speaking parts of Switzerland to become subject to Bern. From 1798 to 1803, Aigle belonged to the canton of Leman in the Helvetic Republic, which was transformed into the canton of Vaud with the mediation of Napoleon. As of 2010, Aigle had an unemployment rate of 8%. As of 2008, there were 257 people employed in the primary economic sector and about 52 businesses involved in this sector. 1,236 people were employed in the secondary sector and there were 99 businesses in this sector. 3,191 people were employed in the tertiary sector, with 377 businesses in this sector. There were 3,618 residents of the municipality who were employed in some capacity, of which females made up 43.4% of the workforce.